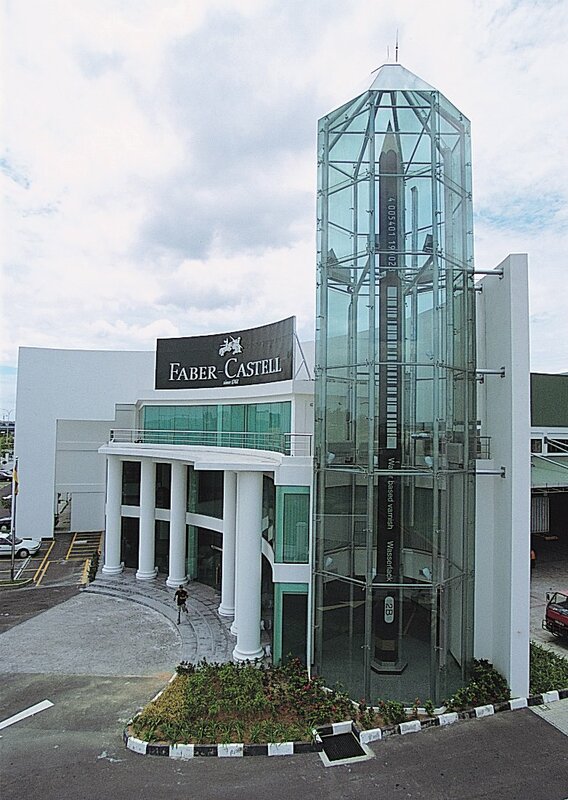 This is a photograph of the World's Largest Pencil, a Castell 9000 located at Faber-Castell's facility in Malaysia near Kuala Lumpur. This pencil is nearly 65 feet tall and is housed in a glass enclosure. Completed in 2002, it is made from Malaysian lumber, fitted from small pieces tongue-and-groove fashion. Once the first half was built, a German-made polymer lead running the full length was inserted and the remainder was built, then sanded and finished. The project required over 7000 man-hours over a two year period to complete. The pencil is listed in the Guinness Book of World Records as the world's largest. The previous record holder is also from Faber-Castell, Germany. 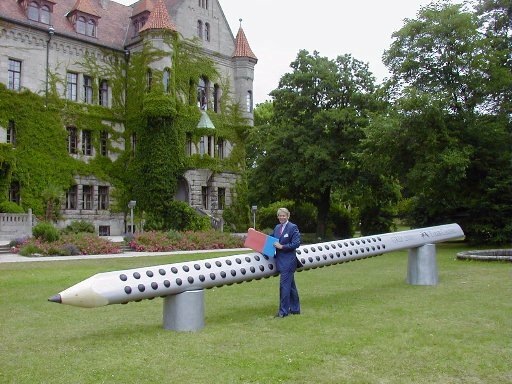 The giant Grip 2001 pencil is shown with Count Anton Wolfgang von Faber-Castell in front of the family castle at Stein near Nuremberg. It is triangular in shape, 12 m in length, weighing approximately 600 kg, and made of Weymouth Pine. The lead is genuine graphite about 12 cm in diameter.